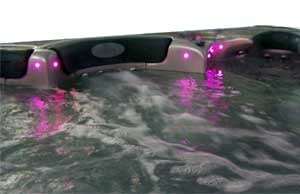 Customize your spa with an LED light package. From standard 9 bulb packages to deluxe perimeter and lighted waterfall packages. We will customize your spa to fit your needs. LED lighting is brighter, more efficient and lasts longer than conventional and fiber optic lighting systems. All systems have multiple color settings to choose from.